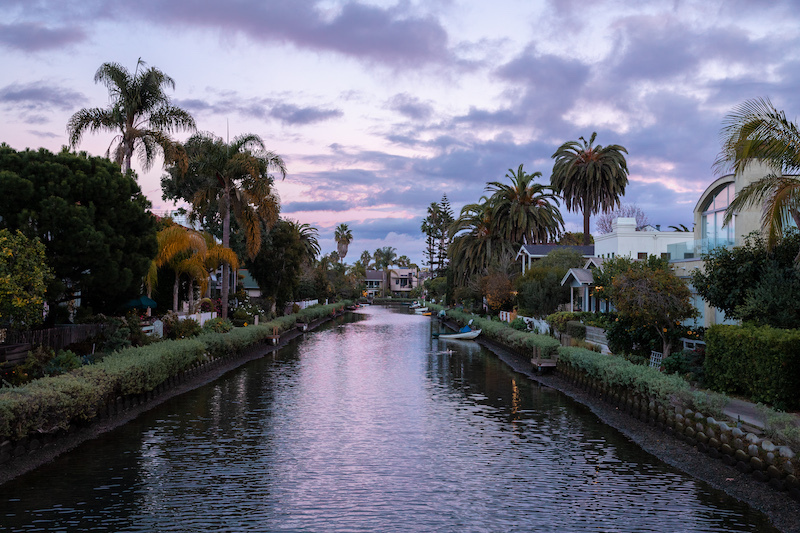 At the Venice Canals before sunset. Photo by Christina Champlin / We Like L.A. This week, from Monday, April 15 to Friday, April 19, features $1 Tax Day Drinks, Spa Week, a 30th Anniversary of Heathers party, Arts Party: Wasteland at The Hammer, Lebowski Fest and MUCH more. 1. Need a little last minute Tax Day relief? We found nine L.A. bars offering $1 drinks today. Scroll down to our Food Pick of the Week section (bottom of weekly round up) for even more Tax Day specials around town. 3. Spa Week returns to Los Angeles April 15-21 for its biannual celebration dedicated to improving personal health by simplifying wellness. Every April and October for one week only, hundreds of spas and wellness locations across North America will offer two or three full-service treatments for just $50 each. 4. Rancho Santa Ana Botanic Garden located in Claremont welcomes Wildflower Week April 13 through April 21. The nine-day celebration of California’s wildflowers will feature annual displays of California poppies, baby-blue eyes, lupines and much more. In addition, there will be an art exhibition, cocktail parties, guided tram tours and more. 5. This Monday and Tuesday Adam Pascal and Anthony Rapp (both original stars of Rent) perform an intimate unplugged concert at the Catalina Jazz Club. 8. E.P. & L.P. in West Hollywood continues their stylish cinema series Melrose Rooftop Theatre with several screenings this week including Wayne’s World, and Creed 2. 9. Get a taste of what South Pasadena has to offer during the 8th Annual Taste of South Pasadena. The evening will include a wine tasting portion, and a restaurant crawl with unlimited food. 10. The Skirball welcomes Scott Hebel and Katie Gurvin of Hebel & Co. for an evening of learning how to create their artisanal halva desserts. Guests will be treated to a cooking demonstration and tasting. 12. Rooftop Cinema Club returns to the rooftops of LEVEL in DTLA and NeueHouse in Hollywood with multiple screenings this week that include Pretty in Pink, Bridesmaid Theme Night Party and more. 13. Culinary Fight Club stops by Marina del Rey for a live cooking competition centered around tapas. Attendees will watch a variety of contestants from home cooks to executive chefs whip up a gourmet dish to be judged by the audience and special judges. 17. Amoeba Music in Hollywood welcomes Cayucas for a signing and performance of their new album, Real Life. 18. Stacks House an experiential pop-up designed to promote financial independence for women opens its doors this Wednesday. A visual Instagram experience, attendees will walk through money-themed rooms that aim to give the viewer financial inspiration for the future. Open Wednesday through Sunday. 19. Museum of Illusions has recently launched a brand new experience. Guests can walk through eye popping 3D exhibits inspired by cartoons, art, current events, pop culture and more. The museum is open daily. 20. There’s a new, immersive horror experience at Zombie Joe’s Underground theater in North Hollywood titled “I want to live in your mouth.” It’s a 20 minute show for one single guest that transports them inside a child’s nightmare. You’ll navigate through corridors, opening doors and meeting creatures, some you wish you had avoided. The show runs Thursday through Sunday. 22. Michelin star European pizzeria L’Antica Pizzera da Michele will pop up at Eataly L.A. on Thursday giving Angelenos a chance to try the famed Neapolitan style pizza before the restaurant opens in Hollywood. 23. If Halloween and horror movies are your favorite topics then I Like Scary Movies Experience will be just what you’re looking for. Guests can expect to see, hear, feel, and smell recreations of iconic moments from IT (2017), Beetlejuice, The Shining, The Lost Boys, and A Nightmare on Elm Street. There won’t be costumed actors jumping out trying to startle but there will be multi-sensory surprises along your winding path. The pop up experience runs April 4 through June 16 Thursday through Sunday. 28. Kaleidoscope Experience comes to the Globe Theatre April 19 – 20 for a two-day whimsical wonderland for adults. Event features include interactive zones, such as the High Score Arcade, Hot Box Disco, Pillow Fort, Cosmic Temple, Rooms of Whimsy, The Rabbit Hole and more. 31. Desert X returns for its bi-annual public art show February 9 through April 21. Spread throughout the Coachella Valley in various locations, artists are commissioned to use the desert landscape as their canvas with breathtaking results. 32. The Egg House visits Los Angeles March 20 – April 28 for an egg-themed, 12,000-square-foot pop-up multi-sensory experience showcasing a series of installations and activations around egg themed creations. Open Wednesday through Sunday. Hyperion Public located in Studio City will give you a free shot of tequila or bourbon with the purchase of any beer. Score one free Original Turkey or Veggie Dog at Hot Dog On A Stick. Must mention this Instagram post. No purchase necessary. The promo happens at participating locations but does not offer a list of locations. Instead they suggest reaching out to locations to confirm. Maple Block Meat Co is offering a $10.99 special smoked pastrami reuben paired with 21st Amendment beer all day. Astro Doughnuts & Fried Chicken will offer a dozen mini doughnuts for $10.99. District in Downtown Los Angeles will offer half-off all California wine bottles all day long. Jane Q in Hollywood will offer a $10.40 pizza and draft beer special.